Carolyn Louise Finley, 69, of Asheville, passed away Saturday, April 6, 2019 at Patewood Rehab & Healthcare Center in Greenville, South Carolina. Carolyn was born in Asheville, North Carolina on April 1, 1950, to the late James and Ruth Finley. 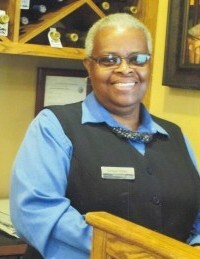 She retired from the Biltmore Estate Winery after fifteen years of dedicated service. She loved to travel and was known for her perpetual smile. Most of all, Carolyn loved spending time with her family. She will be greatly missed. In addition to her parents, she was preceded in death by a brother, Harold B. Finley. Those left to cherish her memory include her longtime partner, James A. Williams of Asheville; a daughter, Shawn Hicks and husband Alex of Spartanburg, SC; a son, Anthony Thompson of Asheville; a brother, James Finley of Asheville; five sisters, Ernestine Taylor of Arizona, Margie Evans, Hazel Finley, Debra Finley, and Tonnie Moorman, all of Asheville; three grandchildren; and five great grandchildren. A celebration of Carolyn’s life will be held at 2:00 p.m., Friday, April 12, 2019 at Hopkins Chapel AME Zion Church with the Reverend Herbert Grant officiating. The family will receive friends from 1:00 p.m. until 2:00 p.m., prior to the service, at the Church.